KnowBe4’s Advanced Reporting feature provides actionable metrics and insight into the effectiveness of your security awareness training program. Beneath the Reports tab, you can create over 60 different styles of reports to meet the needs of your organization. These reports will help you understand where improvements need to be made to improve the strength of your human firewall. With artificially-intelligent and voice-powered technology, Advanced Reporting will create reports instantly based on a spoken command. If preferred, you can type relevant keywords into our Find Report search function to create the report you need. View a quick video overview of this feature here. There are three ways to create an on-demand report. Enter a few keywords for the type of report you’d like to create, then click Find Report. Click the microphone icon and speak your report request into your microphone, then click Send to submit your request. You must allow microphone access to use this feature. Click through our various report types to find the report you'd like to create. Review the below Report Types chart for more information on what each report includes. All reports, with the exception of Group and User Report Cards, can be downloaded to a PDF or CSV. Group and User Report cards can be downloaded to a PDF. Below are some examples of reports that you can generate, either by speaking the request or typing it in the Find Report search bar. See a list of all report types as well as more use cases in our Report Types area. #1 What users are the most vulnerable to a phishing attack? This request will list the overall Phish-prone Percentages of all of your users and allow you to filter by specific groups. The Phish-prone Percentage indicates how likely they are to fall for a phishing attack. #2 What users have not been trained yet? This request will indicate what users have not been enrolled in any training campaigns. This will allow you to target users who are the most vulnerable with security awareness training campaigns. #3 What types of phishing templates are users prone to clicking? This report provides insight into the types of phishing templates your users are susceptible to clicking on. With this, you can provide specialized training on the types of attacks they are prone to falling for. #4 What are my highest-risk groups? This report provides a chart indicating the risk score of all groups and can be filtered by specific groups to find those that have the highest risk. The table below indicates the various reports you can create, the additional filters you can use to modify the reports further, the type of graph or chart created by the reports, and suggested use cases to help you further your security awareness program. This report displays the risk score for all users within the specified date range. See our Virtual Risk Officer (VRO) Guide for details about how risk scores are calculated. Determine your most at-risk users or groups and adjust or modify their Security Awareness Training. This report displays the risk score for all locations (or specific locations) within the specified date range. The available locations are collected from your users’ profile information. Identify risk patterns by location to help adjust or modify user Security Awareness Training. This may be used to help uncover the organizational need for more localized training content. 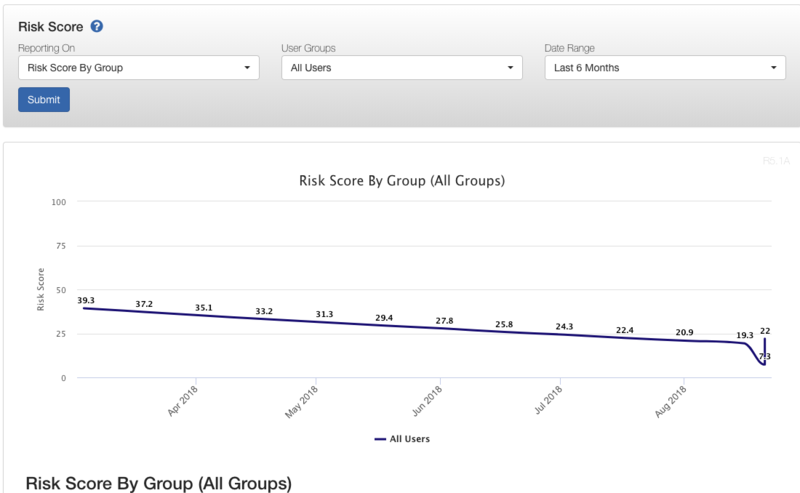 This report displays the risk score of the top ten riskiest users within the selected date range. Determine your most at-risk users and adjust or modify their Security Awareness Training. This report displays a user group summary of the following reports: Group Risk Score, Group Phish-prone Percentage, Failure Types, Group User Count, Top 5 Clicked Templates, and Training Status. A specific group and date can be selected if desired. This information can act as an executive summary to show overall organization risk and the status of your Security Awareness Training. This report displays a user-specific summary of the following reports: Risk Score, User Phish-prone Percentage, Top Failure Types, Top 5 Clicked Emails, and Training Status. A specific user and date can be selected if desired. This information can be useful as an employee appraisal or review to show the user’s level of risk to the organization and to illustrate their Security Awareness Training progress. This report displays the Phish-prone Percentage for all users within the specified date range. See how susceptible a specific group(s) is to phishing attacks. Use this information to determine if your users need more training time, or if their Phish-prone Percentage has improved over time. This report displays the Phish-prone Percentage for the selected phishing campaign(s) within the specified date range. If “All Users” is selected instead of specific groups, your organization’s overall Phish-prone Percentage for the selected campaign(s) will be displayed. At least one campaign must be selected to produce a report. Identify which phishing campaign(s) caused the most phishing test failures. Use this information to pinpoint the type of training your users need the most or the type of attack method your users are most vulnerable to. This report displays the types of failures recorded on the selected phishing campaign across the specified date range. The number of failures, as well as the Phish-prone Percentage, is also included. Identify the different types of failures your users have over different campaigns. Use this information to reinforce user-specific training modules. Also, see what attack vectors your users are most susceptible to. This report displays the average Phish-prone Percentage of users who received their first phishing test each month. Use this information as a baseline to see how likely your users are to fail a phishing attack before being enrolled in Security Awareness Training. 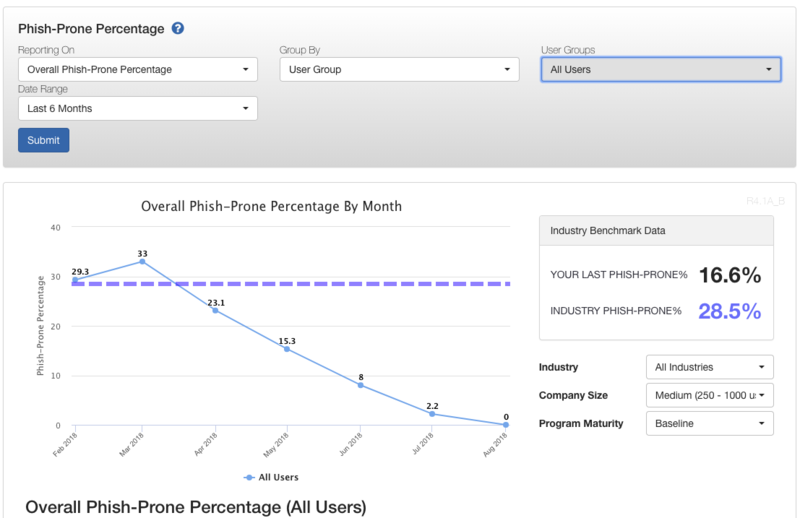 This report displays a graph of the Phish-failure Percentage for the selected user group. See how likely a specific group is to fail a phishing attack. Use this information to determine if your users need more training time, or if their Phish-failure Percentage has improved over time. This report displays the Phish-failure Percentage for the selected phishing campaign(s) within the specified date range. If “All Users” is selected instead of specific groups, your organization’s overall Phish-failure Percentage for the selected campaign(s) will be displayed. Identify which phishing campaign(s) caused the most users to fail a phishing attack. Use this information to pinpoint which of your users need additional training or which campaign caused the most phishing failures. 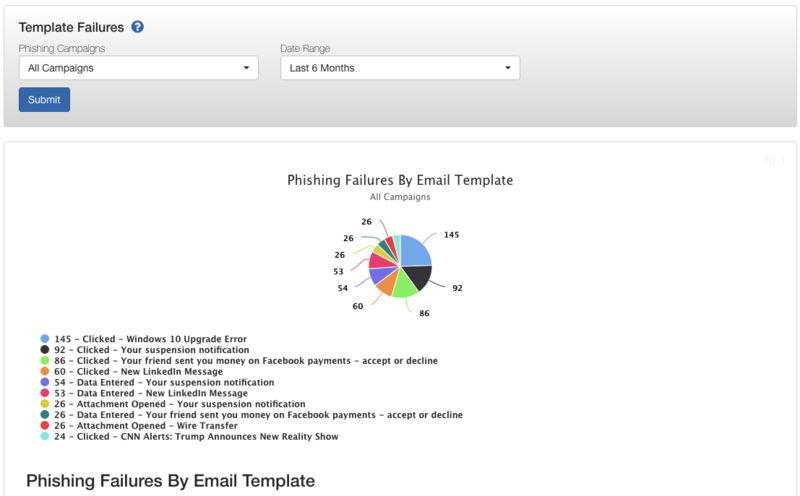 This report displays all of the email templates sent as part of your phishing campaigns within the specified date range, as well as the number of clicks, failures, and other data recorded for each email template. Use this information to keep track of past email templates used, and to determine which templates cause the most failures among users. If your users consistently accumulate a low amount of failures, but you have only been using one-star templates, you may want to increase the difficulty of the email template. This report displays the number of emails sent to groups as part of your phishing campaigns within the specified date range, as well as the number of clicks, the percentage of group members who failed a phishing test, and other data recorded for each group. Use this information to keep track of how many email templates a specific group has received and the overall effectiveness of the phishing campaigns. This information may help identify how frequent or infrequent a specific group is enrolled in a phishing campaign. This report displays a list of email templates that users failed on as part of the selected phishing campaign(s), within the specified date range. For each failure type, the quantity of failures is included. Use this information to see which template your users failed the most and evaluate why it caused users the most trouble. This can help determine if a template may be too advanced or too simple in relation to user training. This report displays the status of user training progress on a campaign over the specified date range and indicates whether or not the users have started, completed or yet to begin their training. Use this information to keep your users on track with their training. This can be useful when determining when to send training notifications or reminders. Use this information to keep your users on track with their training course(s). This can be useful when determining when to send training notifications or reminders. This report displays the status of courses assigned to multiple groups over the specified date range and indicates whether or not the courses have been started, completed, or are still in progress. Use this information to keep your users or specific groups on track with their training. This can be useful when determining when to send training notifications or reminders. This report displays a list of your users and their respective training status, indicating whether or not that user is fully trained, partially trained, or untrained. From this report, you can also see which of your users completed their training past due. This report displays the Phish-prone Percentages of trained and untrained users, within the specified date range. See how training affects your users by comparing the Phish-prone Percentage of untrained and trained users. This information may help when planning training campaigns and/or selecting training content. This report displays the risk score of trained and untrained users, within the specified date range. See how training affects your users by comparing the risk score of untrained and trained users. This information may help when planning training campaigns and/or selecting training content. This report displays the types of phishing test failures recorded for both trained and untrained users, within the specified date range. The quantity of each failure type is included. See how training affects your users by comparing the failure types of untrained and trained users. This information may help when planning training campaigns and/or selecting training content. This report displays the types of phishing test failures recorded for users, within the specified date range. The quantity of each failure type is included. Find out what type of attack vector your users are most vulnerable to (attachments, links, or other) so you can train them on this vulnerability or do additional testing. This report displays the number of hours your user groups have spent in training, across the specified date range. Time spent in training includes any training modules your groups were enrolled in. Groups will only be included in your report if there is relevant data available for that group. Use this information to identify users who haven’t spent enough time in their Security Awareness Training. The amount of training hours spent can reflect in a user’s Phish-prone Percentage or explain why a user is failing phish attacks. This report displays a list of users who have not received a simulated phishing test email within the specified date range. If users have received emails that come from KnowBe4.com (for example, our Security Hints and Tips or Scam of the Week messages) but have not yet been sent a simulated phishing email, they will be included in the report as unphished users. Identify users who haven’t been sent a phishing test and use this information to plan future phishing campaigns. This report displays a list of users who have not completed Security Awareness Training within the specified date range. Only Security Awareness Training courses will apply. See which of your users haven’t completed Security Awareness Training. Use this information to help plan your training campaigns and discover potential gaps in training. This report displays a list of users who have not been assigned Security Awareness Training within the specified date range. See which of your users haven’t been assigned Security Awareness Training yet. Use this information to help plan your training campaigns and discover potential gaps in training. This report displays a list of users who have not started Security Awareness Training within the specified date range. See which of your users haven’t started their Security Awareness Training. Use this information to send out training notifications and reminders to included users. This report displays the number of active users present in your KnowBe4 account, over the specified date range. Use this information to see the fluctuation of users over time, or to review all of your active users. This report displays the number of users added to or removed from your KnowBe4 account, over the specified date range. “Removed” includes users archived or permanently deleted from your console. Use this information to keep a track record of all added and removed users in the console. This may help to discover different trends of user fluctuation. This report displays the login activity of users present in the groups you've selected, over the specified date range. Use this information to view all user login activity across multiple groups. This may help determine which groups are not actively present in their Security Awareness Training. This report displays the number of users within each Phish-prone Percentage range (0%-10%, 10%-20%, and so on). Specific groups can be selected if desired. Use this information to gauge where your users stand in terms of Phish-prone Percentage. Target users or specific groups in a higher Phish-prone Percentage range by enrolling them in Security Awareness Training. Q: I am unable to use the voice command feature when attempting to create a report. A: You must allow your browser to access your microphone to use the voice command feature. A prompt will appear and request access the first time you navigate to the Reports tab. The appearance of the prompt will vary, depending on the browser you’re using. Q: What languages are supported by Advanced Reporting's voice command or Find Report search box feature? A: The English language is supported. Q: What does the Combine Selection Results setting do? A: The Combine Selection Results setting, available on select reports, will combine your selections into one trendline so you can analyze the selected data as a group.